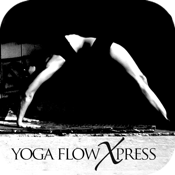 Yoga Flow Xpress is a 30 minute class designed for a student who has taken at least 20 vinyasa flow classes. This class moves you! Be prepared to sweat and move quickly though warm ups, sun salutations, standing postures and more. There is a focus on balances and core strengthening. This class is meant to be challenging! Balancing poses are tough. They take an incredible amount practice, patience, strength and flexibility. The aim of this practice is to find the balance between effort and relaxation, not to be able to bust out a cool yoga pose. The postures themselves are not the means to the end: maintaining grace under pressure however, is! One of my favorite definitions of yoga translates to Mastery Of The Mind. The yoga practice is about learning to control the mental chatter. We put ourselves into all these positions to see how we react to the stress of asking our bodies to do things that we don’t normally do. How do we react when the teacher asks us to do something that we physically can’t yet do? For most of us, we get stressed or annoyed, our breath and heart rate quicken, and maybe we even get jealous at someone who can do it. The yogi aims to merely observe without preference. To watch what is happening and to react with a steady, relaxed breath and calm mind. No preference, no judgment, just that steady inhalation and exhalation regardless if you are doing down dog or side plank. If you are new to yoga, please download my Yoga 101 app first. It’s a free class that will give you a solid understanding of the basics of the yoga practice, as well as teach you the proper breathing technique used. I have one Golden Rule for yoga. Listen to your body. You are the captain of your domain and if any teacher at anytime asks you do to a pose that you think is not something you should do, please do not do it. Listen to yourself. It is perfectly acceptable and expected for people to sit out a pose if needed. The basic philosophy of yoga is ahimsa which means non-harming. Be mindful of what you should and should not be doing. It’s your body and hopefully, you’ve got a long (healthy) way to go in it! Actually, I have two Golden Rules. The other is to be aware of your breath and how it moves through your body. There is magic in that breath. By developing breath awareness you literally learn how to tune in to any moment of your life. I’m excited for you to find out what I am talking about, as it is so powerful it can only be fully understood by actually experiencing it. With a steady yoga practice, you’ll feel years younger than you do NOW! Without a yoga practice, (especially as you get older: stiffer, fatter, more inflexible) there is a great chance you’ll feel 10 years older than you will actually be! Begin now. It really is that simple. Install the app. My personal mission is to inspire 400,000,000 people to do yoga by the year 2020. If you enjoy this app, please share it with your friends and family! For more information or to connect with me, visit my website myyogaminute.com. Check out my other apps offered under myyogaminute in the itunes store. Always consult your physician before beginning any exercise program. This general information is not intended to diagnose any medical condition or to replace your healthcare professional. Consult with your healthcare professional to design an appropriate exercise prescription. If you experience any pain or difficulty with these exercises, stop and consult your healthcare provider. By reading this disclaimer, you hereby agree and understand that the information contained in this website, while helpful, is not medical advice and relying upon it shall be done at your sole risk.